After spending much of the day modestly in the red, it looks like this stock market sell-off is picking up.It’s hard to pinpoint exactly what’s causing this. In it’s FOMC minutes, the Fed said it should be prepared to vary the pace of its quantitative easing program. 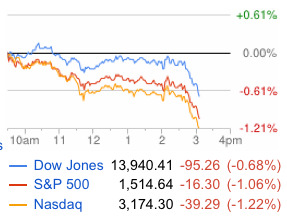 Not exactly earth-shattering stuff, but it reminds the markets that the Fed knows it could tighten. Earlier this morning we got a weak housing number. We also heard from Caterpillar, a major industrial bellwether, that its recent sales have been disappointing. There is also some chatter that a major hedge fund or two may be liquidating its positions.